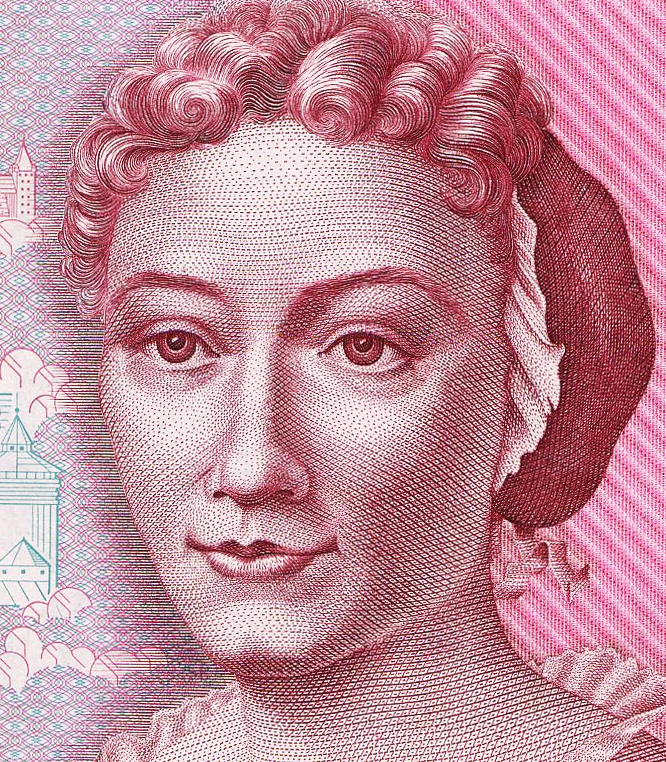 Who was Maria Sibylla Merian? 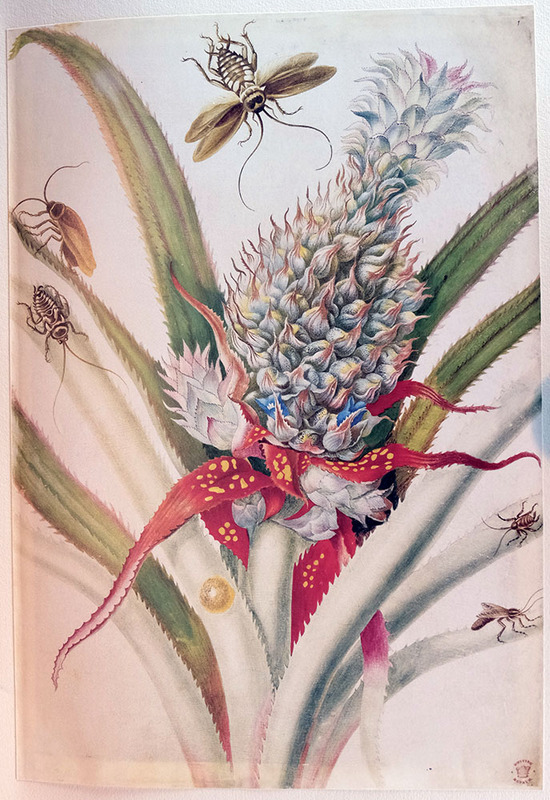 Librarian Christine Kiddey uncovers the fascinating story of the woman behind the remarkable The Surinam Album, full of lavish illustrations of flora and fauna from the former Dutch colony of Suriname in South America. 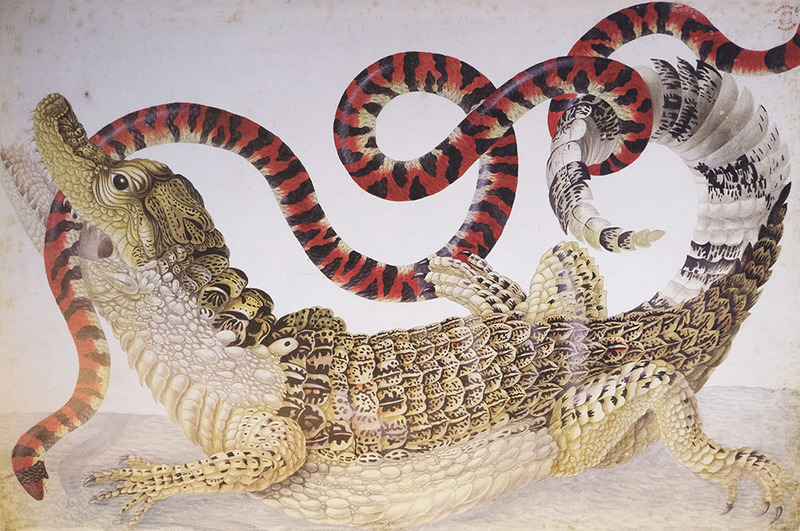 Maria Sibylla Merian (1647-1717) was born in Frankfurt into a family of artists and book publishers, and her interest in both fields was actively encouraged. As a child she learnt to draw, paint, engrave, and produce prints. Her interest in entomology, a very new science during her lifetime, started with a study of silkworms, and developed into a fascination with the metamorphosis of butterflies and moths (the process of transformation from egg to caterpillar, caterpillar to chrysalis, chrysalis to adult insect). Maria Sibylla married at the age to 18, to one of her stepfather’s pupils, and had two daughters. 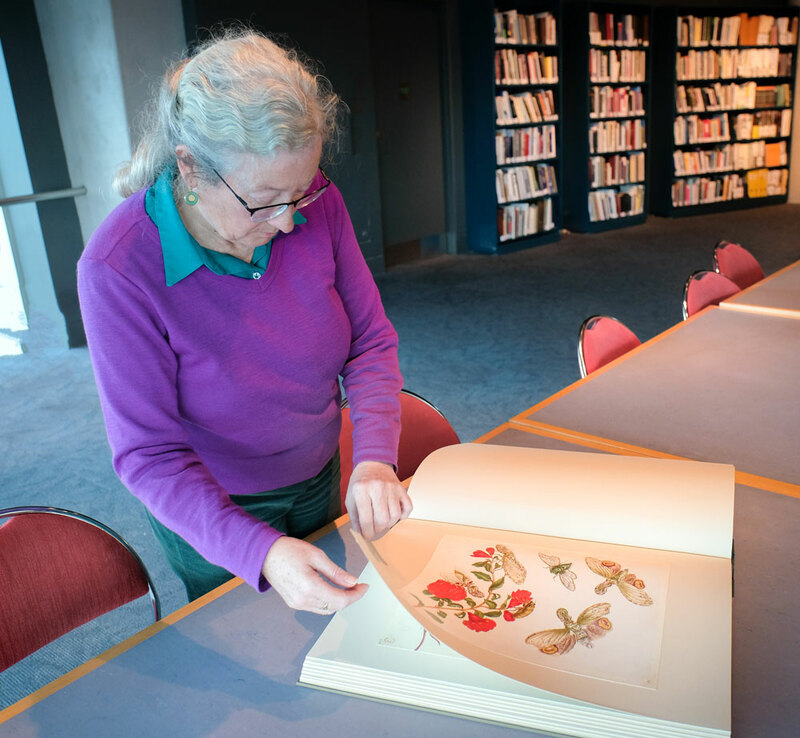 Her interest in insects continued to develop, and she continued to paint, teach art, and explore new artistic methods. In 1675 she published her first work, Florum Fasciculus Primus, a series of engravings of flowers. 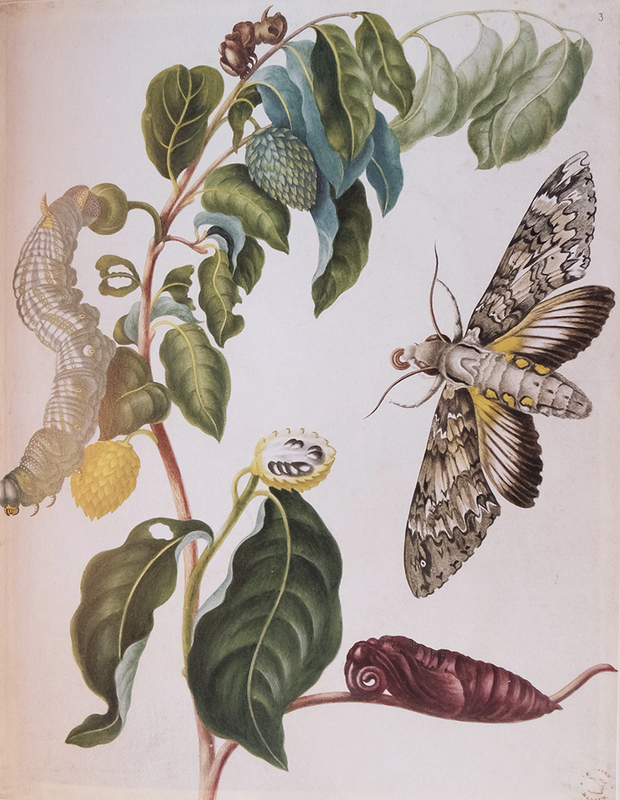 Her next work, The Caterpillars’ Marvelous Transformation and Strange Floral Food (1679-1683), represented 20 years’ worth of careful scientific observation and recording, and made her known to serious naturalists. Her marriage appears not to have been happy, and by 1685 the couple had separated. Maria and her two daughters joined a religious community of Labadists. The emphasis was on a simple but disciplined life, with property held in common. New members had to give up their property, separate from the outer world, and submit to community discipline. However, it gave Maria Sibylla the opportunity to continue her studies. In 1691 Maria Sibylla left the Labadists and moved to Amsterdam with her two daughters. She returned to trading in paints and dealing in natural history specimens. Dutch ships were bringing plants and animals back from overseas trading posts, and there was money to be made. She saw amazing insects being brought back, but she wanted to know more about them. She had contacts in Suriname, and she raised money for her trip by selling off her private collection of paintings and specimens. In 1699 Maria Sibylla and her daughter Dorothea set off on the two-month journey across the Atlantic. Suriname in 1699 was a Dutch settlement, following a long history of Dutch-English rivalry. It was also reliant on slave labours, with thousands of African slaves working sugar plantations. Slaves greatly outnumbered Europeans, and fears of slave insurrections led to brutal discipline. The Dutch Suriname slave owners were notorious for their cruelty. The Europeans were a mixture of Dutch, French, English, and Jewish. Maria Sibylla and Dorothea joined the Dutch elite, and she started studying the natural history of the area. Her interests puzzled the locals, and she records them mocking her for being interested in anything other than sugar. Watching nature from her house wasn’t enough for Maria Sibylla, and she set off on a trip into the jungle, accompanied by her slaves and some local Indians. As well as observing plants and animals she took notice of their uses by the local tribes. 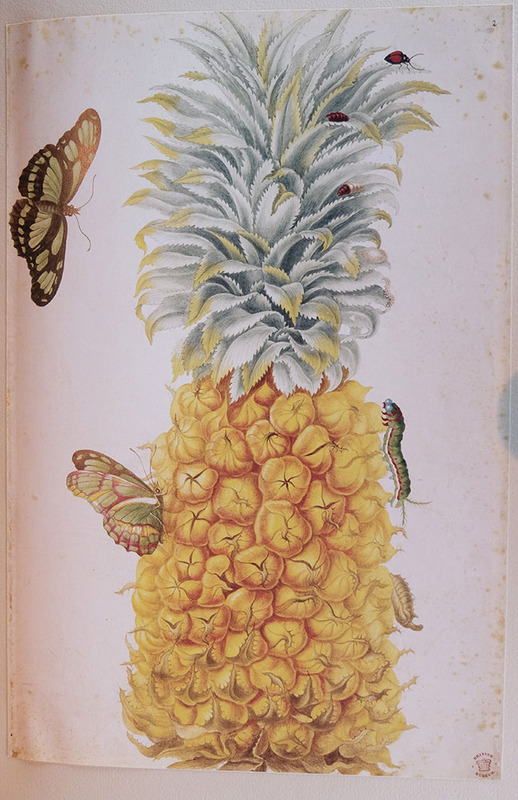 She was fascinated by the exotic new fruits she saw, sampling pineapples, bananas, and melons for the first time, and saw the economic potential in a wider range of crops than the colonists cultivated. Maria Sibylla and Dorothea worked hard to record their observations, and preserved many specimens of plants and animals. In 1702 she nearly died from an illness (possibly yellow fever), and the two women decided it was time to return to Europe. 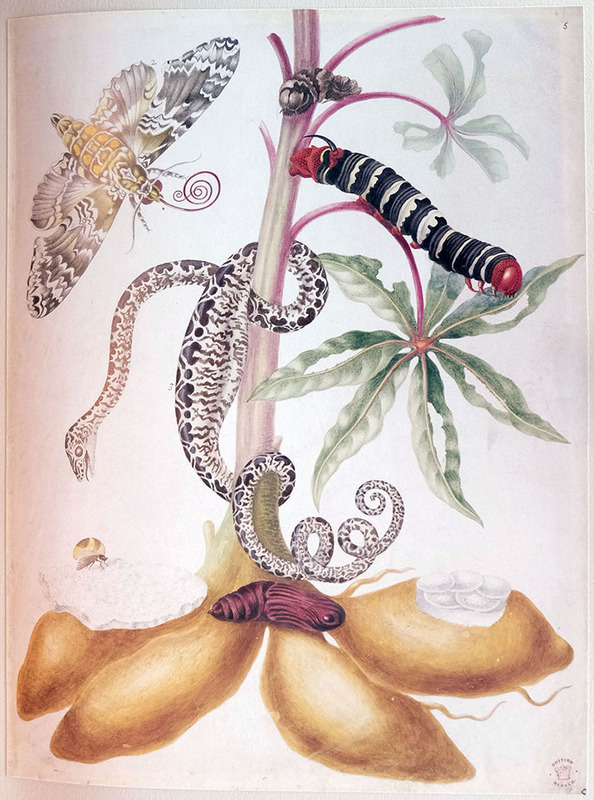 On arriving back in Amsterdam Maria Sibylla displayed and sold some of the exotic specimens they had brought back with them. While working on her Surinam book she found employment illustrating other publications. Her planned book was an enormous undertaking, and called on her publishing and business acumen to raise the necessary finance. By early 1703 she had enough subscribers to start work on the engraving, and in 1705 her book finally appeared. It was well received, enhancing her reputation as a naturalist. Her artwork was much in demand, with many of her paintings and books bought for the Tsar Peter the Great. Maria Sibylla died in 1717, in her 70th year. Dorothea published a collection of her work posthumously, and publication of her work continued. 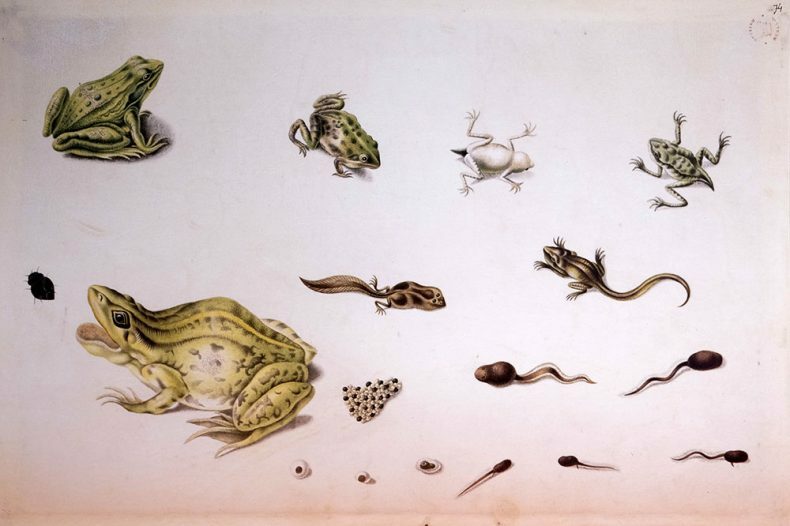 The British Museum has two volumes of her watercolours, one of them being 91 watercolours of the natural history of Surinam. 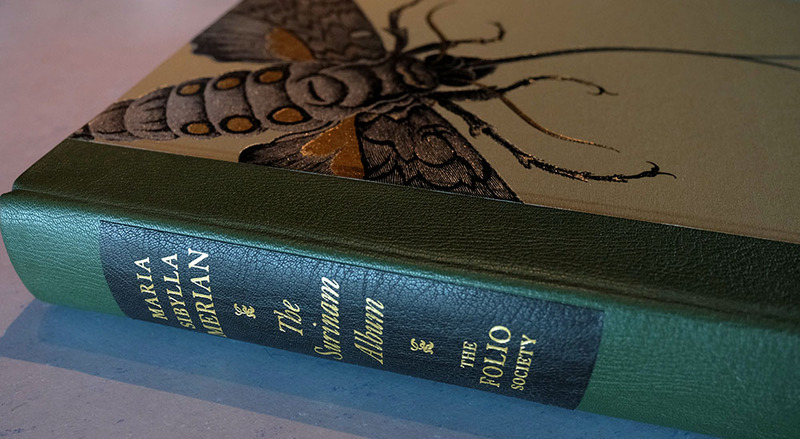 These are the paintings reproduced in the 2006 Folio Society publication of The Surinam Album, a copy of which we are now fortunate enough to own. She was a remarkable woman, a dedicated natural historian, a pioneering entomologist, a fine artist, and a resourceful and adventurous character. Her reputation is now well established, and her portrait has appeared on German stamps and banknotes. In 2005, a research vessel named Maria S. Merian was launched at Warnemünde, Germany, and in 2013 a Google doodle marked the 366th anniversary of her birth. Great blog – thank you Christine. What marvelous illustrations – wonderfully detailed and colourful. Nice connection to the Monrad print collection which contains nineteen prints by Sibylla’s father Matthaus Merian. I didn’t realise that! I think she was fortunate in having a family that encouraged her to learn and to practice art – probably not too common in the 17th century. 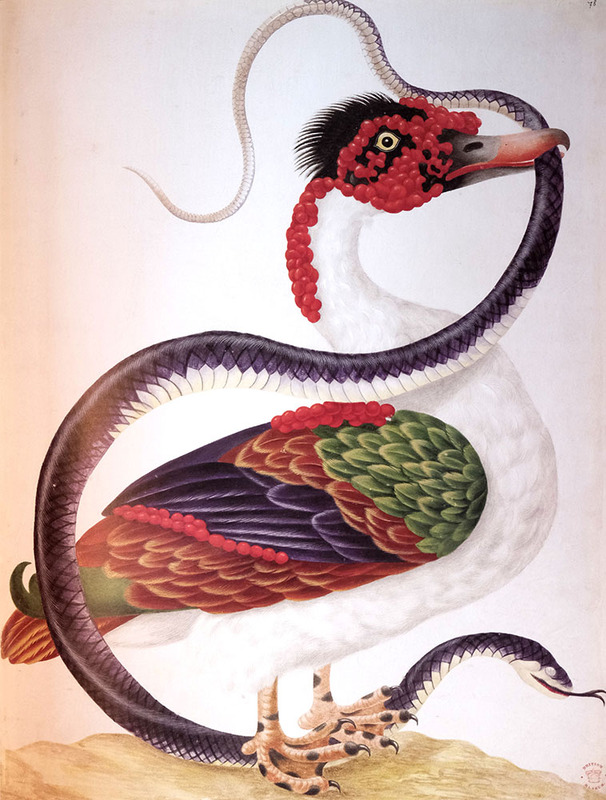 Maria Sibylla also did illustrations for another prominent 17th century naturalist, Georg Rumpf. Good to hear from you! Yes, please come and visit Maria Sibylla next time you’re down. Anyone who is interested to see more of her work is welcome to make and appointment with the library. Thanks for posting this – I love her work. Can I come and look at the book next time I’m in Wellington?